After Tristan Thompson was caught cheating on Khloé Kardashian, we'd be lying if we said we didn't have fears the other sisters might be in unfaithful relationships as well. We know Scott Disick, Kourtney Kardashian's ex, was extremely sketchy during their years together. Kanye West, on the other hand, is seemingly infatuated with Kim Kardashian and would never do her wrong. 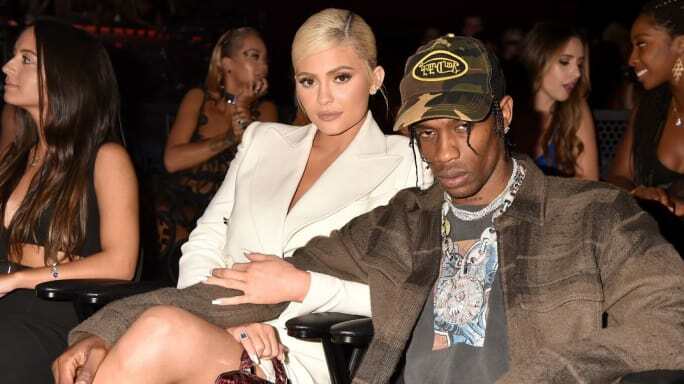 But what about Travis Scott as a boyfriend to Kylie Jenner? Kylie and Travis are no doubt a fan-favorite couple, as the two seem totally in love and have an adorable child together, 10-month-old baby Stormi. That's why when a seemingly incriminating photo of Travis hit the internet today, people freaked out. The photo in question shows Travis leaning in pretty close to another woman, who looks like she's either in a bathing suit or underwear. Despite the two not locking lips, they look pretty cozy. travis scott cheated on kylie jenner. Naturally, the internet and Kylie stans freaked out, heartbroken at the possibility that this perfect relationship really isn't that at all. Many also came to Travis' defense, however, pointing out that it could be an older photo or just not as bad as it seems. One person even claimed it was a screenshot from an upcoming music video. Well, it appears Kylie and Travis have seen the rumors, and the rapper was quick to debunk all of the speculation going around. Taking to Instagram, he called out the "trolls" who are trying to "destroy fake love." "I hate acknowledging s**t. But quit try[ing] to take joy from s**t that's good. I pray god blocks out all evil," Travis concluded. Kylie has not weighed in on the situation, but based on Travis' response, we're sure she won't. That is, unless something else comes out... Let's just hope this isn't as bad as it seems.